I'm a bestselling novelist specializing in historical, military, and espionage thrillers. 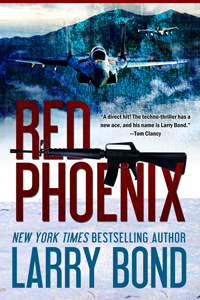 My collaborations with Larry Bond—including Red Phoenix, Vortex, Cauldron, The Enemy Within, and Day of Wrath—have won critical acclaim for their suspense, realism, and unblinking appreciation of geopolitical and modern military realities. 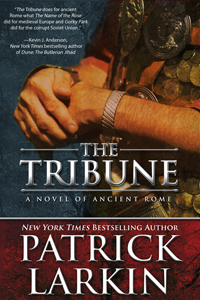 The Tribune, first published in June 2003, is set amid the power, glory, and brutality of imperial Rome. The novel takes readers on a rollercoaster ride through a time of enormous upheaval—a time of great evil...and of great good. The eBook edition of The Tribune is available on Amazon.com, priced at just $2.99! Click here to pick up your own copy! It's also available now as a Nook Book on Barnes and Noble, and through the Apple store, and also at Kobo! Read more about The Tribune, including sample chapters. Here's a link to a short excerpt of The Standard-Bearer: Opening pages of THE STANDARD-BEARER. If you'd like to read an interview with me about my work, my writing process, and my plans for new books, just click through. If you have questions or comments about this site or my work, please click here. Or connect with me through my author's page on Facebook. The eBook version of RED PHOENIX is live on Amazon, Barnes and Noble, the Apple store, and Kobo! Red Phoenix, originally published in 1989, is now out as an eBook. Buy it now on Amazon! Or buy it here through Barnes and Noble! Or through the Apple store. Or go here to Kobobooks.com and search for "Red Phoenix" and "Bond." The Second Korean War has begun. The Third World War may not be far behind. Red Phoenix shows a modern war fought on all fronts: land, sea, and air. Soldiers fight for Korea's snow-covered hills and frozen rice paddies. F-16s race into dogfights across the 38th Parallel. Submarines glide into battle in the otherworldly silence of the deep Pacific. And from the hushed, anxious corridors of power in Washington, to those in Moscow and Beijing, the growing war spreads its explosive economic and political ripples to Europe, Japan, and the world. Special Deal: CAULDRON is live on Amazon, Barnes and Noble, the Apple store, and Kobo and it's just $0.99 for a limited time only! 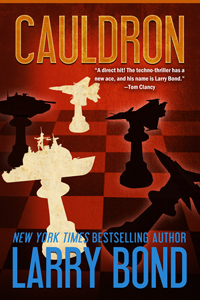 Larry Bond and I have released our third bestselling military thriller, Cauldron, as an eBook. Buy it now for your Kindle. Or your Nook. Or through the Apple store. Or go to Kobo Books here and search for "Cauldron" and "Bond." 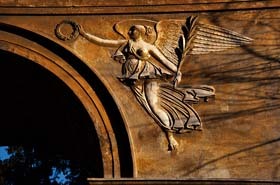 In Cauldron, the newly liberated states of eastern Europe are struggling to rebuild after decades of communist misrule. As old nationalistic hatreds boil to the surface, there are some nations eager to exploit their new economic power to satisfy age-old and long-suppressed imperial ambitions—using military force if necessary. While a new wave of atrocity and massacre ripples across the Balkans, and Russia slides further into anarchy, France and Germany seize their chance to establish themselves jointly as a single superpower dominating the whole of Europe. With the Eurozone in growing crisis, the situation we first portrayed in 1993 may actually be even closer to reality than at any time since this thriller was first published. VORTEX is live on Amazon, Barnes and Noble, the Apple store, and Kobo! 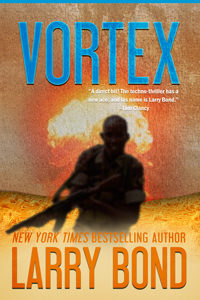 Our second is Vortex, originally published in 1991. Buy it now for your Kindle. Or your Nook. Or through the Apple store. Or go to Kobo Books here and search for "Vortex" and "Bond." The political situation we portray has, thankfully, been overtaken by real-world events, but the story we tell is still as fresh and exciting as ever. The world is no longer dominated by two superpowers, and the theater of war has shifted to the Third World—but with a deadly uncertainty never known before. In Vortex, the flashpoint is South Africa, where a repressive extreme-right regime has catapulted to power, determined to crush the slightest opposition. The result is a conflict that will rage across the whole of southern Africa, across deserts, across the veldt, in the cities, at sea, and in the air. It will realize many of mankind's worst fears, including the full-scale use of both chemical and nuclear weapons. It will raise the nightmare specter of race war, global economic collapse, and Armageddon itself. As chaos spreads across an entire continent, the United States mobilizes for a military campaign it cannot afford to lose. 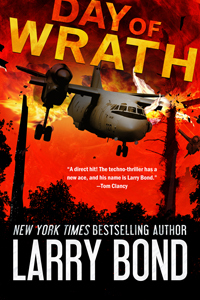 DAY OF WRATH is live on Amazon.co.uk! The fifth thriller that Larry Bond and I wrote together is now available as an eBook through Amazon.co.uk. Buy it now! As Day of Wrath opens, a plane carrying an American arms inspection team mysteriously crashes in Russia. The warning shot has been fired. A bold gambit to destroy America as a world power is well underway. Its architect is Prince Ibrahim al Saud, a member of the Middle East's most influential royal family and the brilliant head of a multi-billion-dollar global conglomerate. He also heads a world-wide alliance of terrorists. With his vast wealth, he bankrolls and directs the most lethal terrorist groups on earth to launch the most murderous attack ever conceived. THE ENEMY WITHIN is live on Amazon.co.uk! 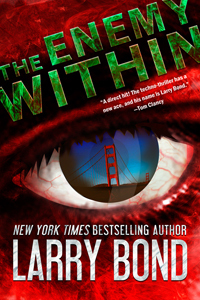 Larry Bond and I have released our fourth thriller, The Enemy Within, as an eBook through Amazon.co.uk. Buy it now! The Enemy Within focuses on terrorism and counter-terrorism. And much of the action centers around two heroes, Lieutenant Colonel Peter Thorn and FBI Special Agent Helen Gray, who are forced to confront a ruthless and highly intelligent enemy determined to bring the United States, and, ultimately, the whole Western world, to its knees. This novel (originally published in 1996) asks a single, horrifying question: What if a rogue nation launched a war against the United States within its own borders? America's largest cities are in flame. Its majestic landmarks are in ruins. Electronic sabotage cripples its far-flung communications systems. The first waves of a meticulously orchestrated international terrorist campaign have achieved a stunning and terrifying success. 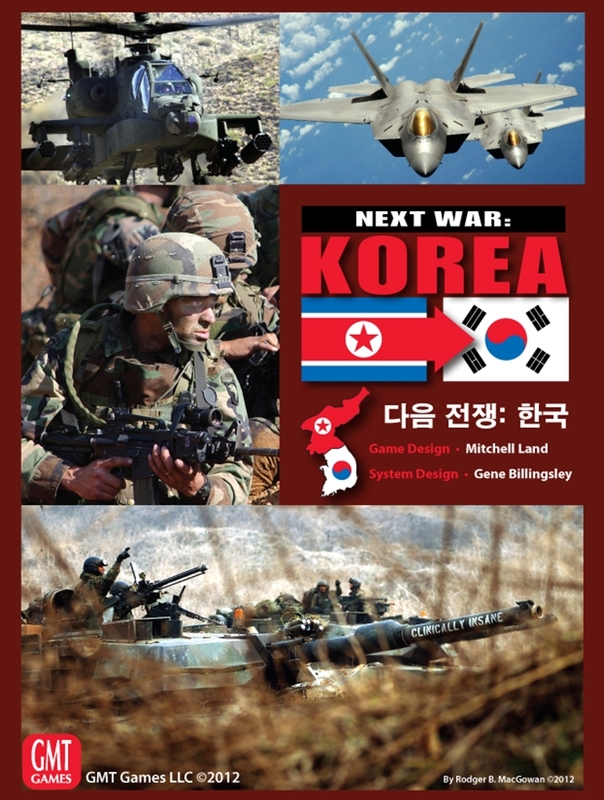 In a nice piece of serendipity now that RED PHOENIX is out as an eBook, GMT Games has just released a board wargame, Next War: Korea, that gives players a chance to test their skill as commanders in a present-day war fought on the ground, in the air, and at sea. If you'd like to check it out, just click here to go to the game's page at the GMT web site. The Lazarus Vendetta, fifth in Robert Ludlum's bestselling Covert-One series, is a thriller pulled from today's headlines. The Lazarus Movement, the dominant force in the eco-conscious, "anti-technology" protest movement, has sent rumblings down the corridors of the world's intelligence agencies. Led by a mysterious, never-seen figure known only as Lazarus, this increasingly powerful group is believed by some to be preparing a bold strike. When an attack on a nano-technology research facility leaves thousands dead—protesters and scientists alike—from what appears to be a cloud of inadvertently released but gruesomely deadly nanobots, pandemonium reigns. Lieutenant Colonel Jonathan Smith is activated by Covert-One to find the truth about Lazarus where all others have failed. As Smith uncovers the frightening underpinnings of the group, he soon learns that the Lazarus Movement is only the very tip of the iceberg in a murderous scheme that threatens billions of lives and will forever change the nature of the world itself. 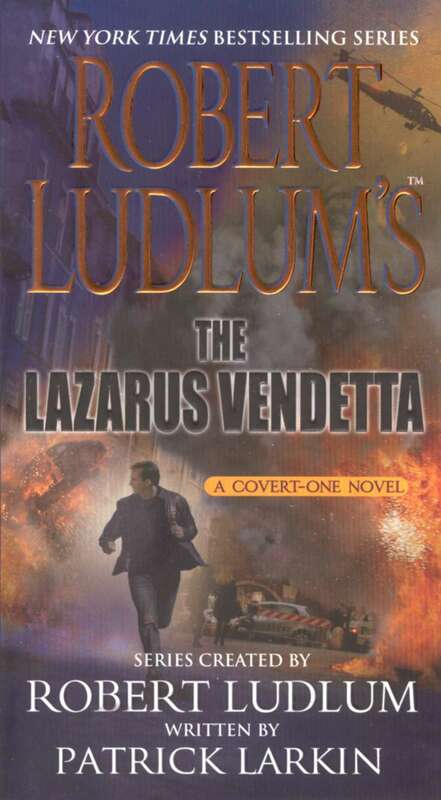 First published in October 2004, The Lazarus Vendetta is in bookstores now as a premium edition St. Martin's paperback. The Moscow Vector, sixth in the bestselling Covert-One series, again draws readers into a world of high-tech espionage, international intrigue, and high-stakes action. At an international conference in Prague, Lieutenant Colonel Jon Smith, an Army research doctor specializing in infectious diseases and secretly an agent attached to Covert-One, is contacted by a Russian colleague, Dr. Valentin Petrenko. Petrenko is concerned about a a small cluster of mysterious deaths in Moscow—deaths the Russian government is keeping secret. But when the two men meet, they are attacked. Petrenko is killed, his notes and medical samples are lost, and Smith barely escapes with his life. At the same time, government and intelligence officials around the world are coming down with an untraceable, fast-acting virus with a 100 percent fatality rate. These deaths appear somehow connected to the increasingly militaristic Russian government, headed by the autocratic and ambitious President Viktor Dudarev. With few clues and precious little time, Smith and Covert-One must unravel this plot and zero in on the shadowy figure who stands at the center of it all. 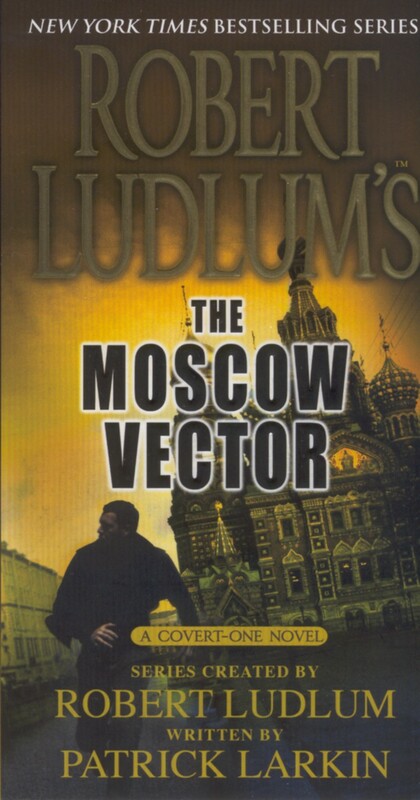 First published in July 2005, The Moscow Vector is in bookstores now as a St. Martin's paperback. The premium edition St. Martin's paperback is being released in late June 2012. "Larkin's always competent and reliable storytelling abilities are augmented here by an ingenious weapons concept that is all the more frightening because of its believability. Those who have never sampled a Covert-One novel will find The Moscow Vector an excellent place to begin, as Larkin brings Ludlum's Cold War villains full circle with a 21st century weapon to boot. Recommended." — Reviewed by Joe Hartlaub at Bookreporter.com. Congratulations to the winners of the Larry Bond and Patrick Larkin Book Quiz! For 14 days, contestants competed to identify a series of pictures of military hardware, weapons, unit badges, and places used in some of our bestselling thrillers—Red Phoenix, Vortex, Cauldron, The Enemy Within, and Day of Wrath! It was a real challenge for Larry and I to try to stay ahead of their knowledge and expertise. First place -- and a specially written and signed action scene -- goes to Pawel Kasperek. If you'd like to read the scene Larry and I wrote for Pawel, just click here. Second place went to Jason Leffler and third place went to Sermon Weerts. They'll each receive a book label signed by both of us to put in the thriller of their choice. If you'd like to see the pictures that were used, and see what the real answers were, just click the Bond and Larkin Quiz Contest. And stay tuned for our next contest. Novels written with Larry Bond. Site Construction Kudos: Thomas T. Thomas, a very talented writer in his own right, provided invaluable aid and advice. Thanks Tom!